The Smart Cable Company's SC845 opens up a new world of possible hardware combinations when connecting to an RJ45 serial device. 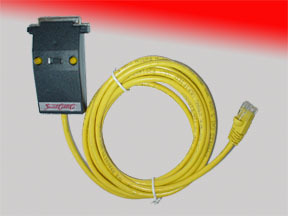 Smart Cable SC845 makes it possible for you to connect on the serial side from an RJ45 connector to a DB25 connector automatically. All you do is plug the RJ45 male connector into your peripheral and plug the female DB25 pin connector into the serial port on a computer or other serial device, set the switch and you're ready to run. The patented Smart Cable logic takes care of the rest for you!